Hey, the government says there is no inflation…hmm, guess ecletricity doesn’t count! The average price for a kilowatt hour of electricity set a record for the month of November, according to BLS. During the year, electricity prices tend to bottom out in the late fall, winter and early spring and hit a peak in the summer. 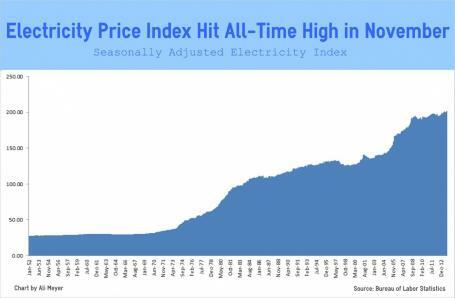 Electricity prices followed that pattern this year, but in each month of the year they set a record for that particular month—n.b. electricity was more expensive in January 2013 than in any previous January.